The following release notes for OpenShift Container Platform 3.4 summarize all new features, major corrections from the previous version, and any known bugs upon general availability. The OpenShift Container Platform version must match between master and node hosts, excluding temporary mismatches during cluster upgrades. For example, in a 3.4 cluster, all masters must be 3.4 and all nodes must be 3.4. However, OpenShift Container Platform will continue to support older oc clients against newer servers. For example, a 3.3 oc will work against 3.2, 3.3, and 3.4 servers. [a] Where N is a number greater than 1. Red Hat OpenShift Container Platform version 3.4 (RHBA-2017:0066) is now available. This release is based on OpenShift Origin 1.4. New features, changes, bug fixes, and known issues that pertain to OpenShift Container Platform 3.4 are included in this topic. OpenShift Container Platform 3.4 now supports both Kubernetes deployments objects (currently in Technology Preview) and the existing deployment configurations objects. See Kubernetes Deployments Support for more details on usage and support. Pod disruption budgets (currently in Technology Preview) allow the specification of safety constraints on pods during operations. Users with cluster-admin privileges can use them to limit the number of pods that are down simultaneously for a given project. See Managing Pods for more details. The default pods per core for a node is now set to 10. Machines with less than 10 cores now have a smaller maximum pod capacity than previously configured. Administrators can change this setting by modifying the pods-per-core value. See the Setting Maximum Pods Per Node section of the Administration Guide for more information. See Setting Quotas for more details. Cluster administrators could previously configure nodes' pod eviction policy based on available memory. With this release, eviction policy can now also be configured based on available disk. When configured, the node can report disk threshold violations, and the scheduler no longer tries to put pods on those nodes. The node ranks pods and then evicts pods to free up disk space. See Handling Out of Resource Errors for more details. See Dynamic Provisioning and Creating Storage Classes for more details. Users can now more easily integrate with the OpenShift Container Platform-provided OAuth server from their own applications deployed within their project. You can now use service accounts as a scope-constrained OAuth client. See Service Accounts as OAuth Clients for more details. Users can now use wildcard routes to determine the destination of all traffic for a domain and its subdomains. For example, *.foo.com can be routed to the same back-end service, which is configured to handle all the subdomains. You can specify that a route allows wildcard support through an annotation, and the HAProxy router exposes the route to the service per the route’s wildcard policy. The most-specific path wins; for example, bar.foo.com is matched before foo.com. See Creating Routes Specifying a Wildcard Subdomain Policy and Using Wildcard Routes (for a Subdomain) for more details. A --tags pre_upgrade Ansible option for running a dry-run that performs all pre-upgrade checks without actually upgrading any hosts and reports any problems found. New playbooks broken up into smaller steps when possible, allowing you to upgrade the control plane and nodes in separate phases. Customizable node upgrades by specific label or number of hosts. New atomic-openshift-excluder and atomic-openshift-docker-excluder packages that help ensure your systems stay locked down on the correct versions of OpenShift Container Platform and Docker when you are not trying to upgrade, according to the OpenShift Container Platform version. Usage is documented in relevant installation and upgrade steps. 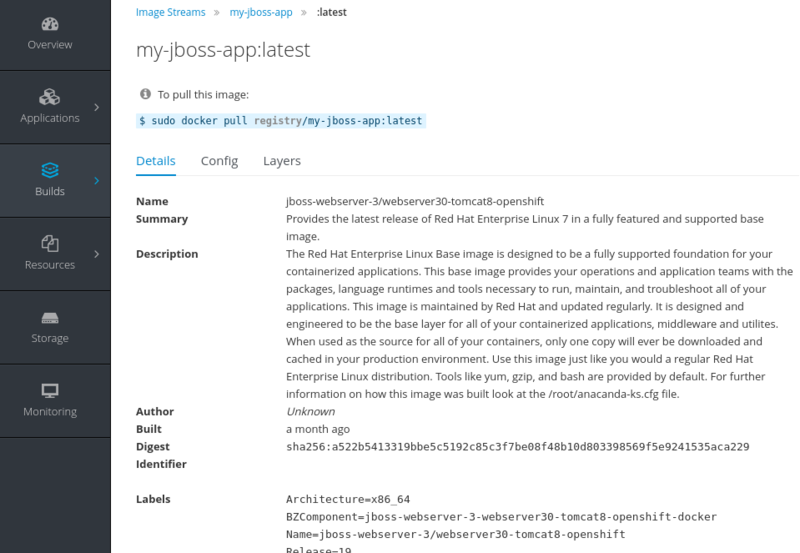 A new image layout view has been added to the OpenShift Container Platform web console, providing additional information about specific images in the OpenShift Container Platform registry by clicking on their tags from the Builds → Images page. OpenShift Container Platform, however, is still limited to images of the form $namespace/$name, and cannot create multi-segment images. OpenShift Pipelines, introduced in OpenShift Container Platform 3.3 as a Technology Preview feature, are now fully supported. OpenShift Pipelines are based on the Jenkins Pipeline plug-in. 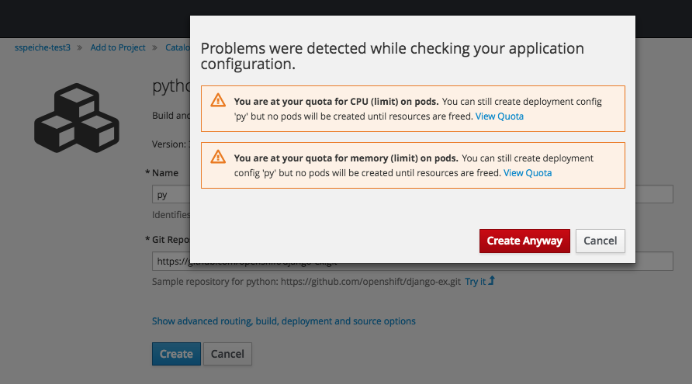 By integrating Jenkins Pipelines, you can now leverage the full power and flexibility of the Jenkins ecosystem while managing your workflow from within OpenShift Container Platform. OpenShift Container Platform users using integrated Jenkins CI and CD pipelines can now leverage Jenkins 2.0 with improved usability and other enhancements. Users who deploy an OpenShift Container Platform integrated Jenkins server can now configure it to allow automatic logins from the web console based on an OAuth flow with the master instead of requiring the standard Jenkins authentication credentials. 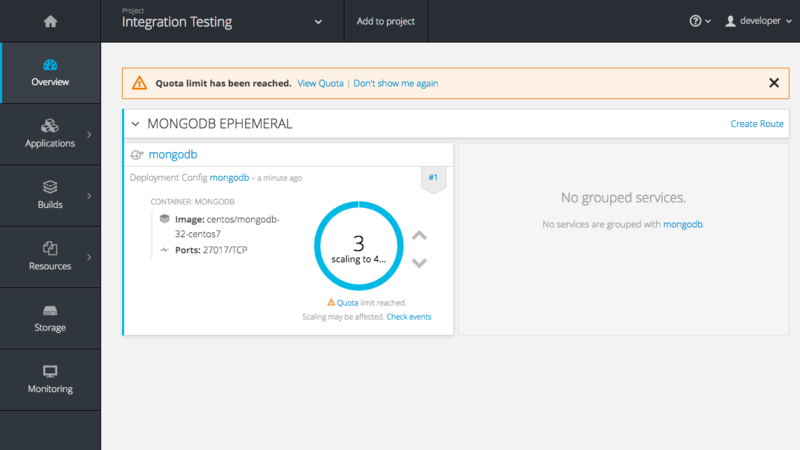 See OpenShift Container Platform OAuth Authentication for configuration details. Cluster administrators can now designate nodes to be used for builds (i.e., Source-to-Image and/or Docker builds) so that build nodes can be scaled independently from the application container nodes. Build nodes can also be configured differently in terms of security settings, storage back ends, and other options. See Configuring Global Build Defaults and Overrides for details on setting nodeSelector to label build nodes, and Assigning Builds to Specific Nodes for details on configuring a build to target a specific node. To make navigation easier for users interacting with large numbers of projects, the Projects page now has a text filter by name, display name, description, and project creator. It also allows sorting on several of these attributes. The existing Add to project catalogy could become cluttered when dealing with builder images with many versions or many templates with slight differences. Previously, the focus was minimizing the number of clicks to get an application running, however the updated layout now focuses on helping you find what you are actually looking for. The main catalog page now only contains high-level categories Languages and Technologies, and underneath those are subcategories, such as Java and Data Stores. Clicking one of those shows redesigned tiles for build images and templates. Different versions of the same builder image now all roll-up into the same tile with the semantically latest version automatically selected. All of the default image streams and templates have also now been updated with better display names, descriptions, and categorization. If you do not like the default categories and subcategories, you can also now customize those as well. See Configuring Catalog Categories for more details. It was previously difficult to set up a build against a private Git repository from the web console. You had to import YAML or JSON to create your secret, then edit your build’s YAML to make it use that secret. You can now expand the advanced build options, create a user and password or SSH key-based secret, then specify that the build use that when cloning your source. If you already have your secret created in the project, you can also choose any of the existing ones. Setting up push and pull against private image registries has also been improved. The build configuration editor now allows you to set up a push or pull secret in case the image you are building from, or the image stream you are pushing to, is in a secure registry. Similarly, the new deployment configuration editor allows you to specify a pull secret. Many of the existing editing actions still exist as separate actions, such as editing health checks, or configuring different resource limits. If you want to make a number of changes without triggering a deployment for each change, you can now pause your deployment, make all the changes you want, and then resume it. Pausing prevents any deployment from happening, no matter whether it was automatically or manually triggered. On the Overview as a generic warning if anything in your quota is at its limit. On the Overview pod count visualizations when you are unable to reach your scale target due to quota. If you try to create something and you are out of quota for that resource. If you try to create something and it will cause you to exceed quota for a resource. An important feature for users that want to collaborate with the same projects, the new membership management interface allows you to add and remove roles to users, groups, and service accounts within your project. Project administrators have access to view and modify the project’s membership. Membership management is the only difference between an administrator and an editor in the default OpenShift Container Platform roles. Cluster administrators can add a description to any role to provide extra information for end users about what that role actually allows. Tab selection, label filters, and several other options that change page state are now persisted to the URL throughout the web console. This allows you to bookmark specific pages and share with others. If your cluster administrator sets up storage classes, they will be available for you to pick from in the Create Storage page. Fit in seamlessly on the Overview page alongside your existing deployment configurations. Appear on the Applications → Deployments page. Support many of the actions already supported for deployment configurations (excluding the new editor). Pods for a PetSet roll up into a single card with a pod count visualization like the other controllers. Metrics viewable on the overview for the pods in the PetSet. OpenShift Container Platform 3.4 introduces the following notable technical changes. TLSV1.2 is now the only supported security version in OpenShift Container Platform version 3.4 and later. You must update if you are using TLSV1.0 or TLSV1.1. Kubernetes has been updated to v1.4. OpenShift Container Platform 3.4 requires Docker 1.12.
etcd has been updated to 3.1.0-rc.0. While etcd has been updated from etcd 2 to 3, OpenShift Container Platform 3.4 continues to use an etcd 2 data model and API for both new and upgraded clusters. This stack also now uses a common data dictionary and format for how Red Hat names components, systems, capabilities, and more when referring to them in a log message. As a result, search queries will be able to be reused across other Red Hat products. The pattern for the operations logs remains the same. Downgrading from Elasticsearch 2.4 to Elasticsearch 1.x is not possible due to migration to a new data structure. The default OpenShift SDN has been modernized and converted to a Kubernetes CNI plug-in. OpenShift SDN presents itself to Kubernetes as a network plug-in and assumes responsibility for IPAM instead of Docker. As a side effect, Docker is no longer used for pod IP address management, so running the docker inspect command will no longer show the pod’s IP address and other network details. Pod IP details are still (and have always been) available through oc describe pod command output. The deploymentConfig.spec.strategy.rollingParams.updatePercent field is removed in favor of deploymentConfig.spec.strategy.rollingParams.maxUnavailable and deploymentConfig.spec.strategy.rollingParams.maxSurge. The pre-OpenShift Origin 1.0 compatibility fields for service spec.portalIP and pod spec.host have been removed from the API. Use spec.clusterIP for services and spec.nodeName for services. Clients that send these fields to the server will have those values ignored. The oc whoami --token command is deprecated in favor of oc whoami -t, and oc whoami --context is deprecated in favor of oc whoami -c. The --token and --context options will be removed in a future release. Support for OpenShift Container Platform 3.1 clients for deployment configurations is dropped. More specifically, the oc scale command will not work as expected. When Autodeploy when: New image is available was unchecked in the web console’s Add to project page, the web console would not create an image change trigger on the new deployment configuration. This meant that users had to manually set an image using the oc set image command before deployments. Otherwise, all deployments would fail with image pull back-off errors. The following are known issues for the OpenShift Container Platform 3.4 initial GA release. Previously, upgrading from OpenShift Container Platform 3.3 to 3.4 caused all user identities to disappear, though they were still present in etcd, and OAuth-based users could no longer log in. New 3.4 installations were also affected. This was caused by an unintentional change in the etcd prefix for user identities; egressnetworkpolicies were similarly affected. This bug has been fixed as of the OpenShift Container Platform 3.4.0.40 release. The bug fix restores the previous etcd prefix for user identities and egressnetworkpolicies, and as a result users can log in again successfully. Security, bug fix, and enhancement updates for OpenShift Container Platform 3.4 are released as asynchronous errata through the Red Hat Network. All OpenShift Container Platform 3.4 errata is available on the Red Hat Customer Portal. See the OpenShift Container Platform Life Cycle for more information about asynchronous errata. This section will continue to be updated over time to provide notes on enhancements and bug fixes for future asynchronous errata releases of OpenShift Container Platform 3.4. Versioned asynchronous releases, for example with the form OpenShift Container Platform 3.4.z, will be detailed in subsections. In addition, releases in which the errata text cannot fit in the space provided by the advisory will be detailed in subsections that follow. OpenShift Container Platform release 3.4.0.40 is now available. The list of packages and bug fixes included in the update are documented in the RHBA-2017:0186 advisory. The list of container images included in the update are documented in the RHBA-2017:0187 advisory. To upgrade an existing OpenShift Container Platform 3.3 or 3.4 cluster to this latest release, use the automated upgrade playbook. See Performing Automated In-place Cluster Upgrades for instructions. OpenShift Container Platform release 3.4.1.2 is now available. The list of packages and bug fixes included in the update are documented in the RHBA-2017:0218 advisory. The list of container images included in the update are documented in the RHBA-2017:0219 advisory. Space precluded documenting all of the bug fixes for this release in their advisories. See the following sections for notes on upgrading and details on the bug fixes included in this release. OpenShift Container Platform release 3.4.1.5 is now available. The list of packages and bug fixes included in the update are documented in the RHBA-2017:0268 advisory. The list of container images included in the update are documented in the RHBA-2017:0267 advisory. OpenShift Container Platform release 3.4.1.7 is now available. The list of packages and bug fixes included in the update are documented in the RHBA-2017:0289 advisory. The list of container images included in the update are documented in the RHBA-2017:0290 advisory. The container images in this release have been updated using the rhel:7.3-66 and jboss-base-7/jdk8:1.3-6 base images, where applicable. OpenShift Container Platform security and bug fix advisory RHSA-2017:0448, providing updated atomic-openshift-utils, ansible, and openshift-ansible packages that fix several bugs and a security issue, is now available. The security issue is documented in the advisory. However, space precluded documenting all of the non-security bug fixes for this release in the advisory. See the following sections for notes on upgrading and details on the bug fixes included in this release. OpenShift Container Platform release 3.4.1.10 is now available. The list of packages and bug fixes included in the update are documented in the RHBA-2017:0512 advisory. The list of container images included in the update are documented in the RHBA-2017:0513 advisory. The container images in this release have been updated using the rhel:7.3-74 and jboss-base-7/jdk8:1.3-10 base images, where applicable. This release also provides an optional script for migrating image manifests from etcd to the registry’s configured storage (see BZ#1418359 in Bug Fixes). The script is installed at /usr/share/atomic-openshift/migration/migrate-image-manifests.sh on all master hosts that use the RPM installation method. You can then continue with the rest of this section. You can use the -r option to specify the registry URL (otherwise the script will attempt to determine it), and the -s if the registry is secured and specify the CA certificate with -c.
OpenShift Container Platform release 3.4.1.12 is now available. The list of packages and bug fixes included in the update are documented in the RHBA-2017:0865 advisory. The list of container images included in the update are documented in the RHBA-2017:0866 advisory. The container images in this release have been updated using the rhel:7.3-74 base image, where applicable. OpenShift Container Platform release 3.4.1.16 is now available. The list of packages and bug fixes included in the update are documented in the RHBA-2017:0989 advisory. The list of container images included in the update are documented in the RHBA-2017:0990 advisory. OpenShift Container Platform release 3.4.1.18 is now available. The list of packages and bug fixes included in the update are documented in the RHBA-2017:1129 advisory. The list of container images included in the update are documented in the RHBA-2017:1130 advisory. OpenShift Container Platform release 3.4.1.24 is now available. The list of packages and bug fixes included in the update are documented in the RHBA-2017:1235 advisory. The list of container images included in the update are documented in the RHBA-2017:1236 advisory. OpenShift Container Platform release 3.4.1.33 is now available. The packages and bug fixes included in the update are documented in the RHBA-2017:1425 advisory. The container images included in the update are provided by the RHBA-2017:1426 advisory and listed in Images. OpenShift Container Platform release 3.4.1.37 is now available. The list of packages and bug fixes included in the update are documented in the RHBA-2017:1492 advisory. The list of container images included in the update are documented in the RHBA-2017:1493 advisory. OpenShift Container Platform bug fix and enhancement advisory RHBA-2017:1666, providing updated atomic-openshift-utils and openshift-ansible packages that fix several bugs and add enhancements, is now available. OpenShift Container Platform release 3.4.1.44 is now available. The packages and bug fixes included in the update are documented in the RHBA-2017:1640 advisory. The container images included in the update are documented in the RHBA-2017:1646 advisory. Space precluded documenting all of the bug fixes for this release in the advisory. See the following sections for notes on upgrading and details on the bug fixes included in this release. OpenShift Container Platform release 3.4.1.44 is now available. The packages and bug fixes included in the update are documented in the RHBA-2017:1828 advisory. The container images included in the update are provided by the RHBA-2017:1829 advisory and listed in Images. Space precluded documenting all of the images for this release in the advisory. See the following sections for notes on upgrading and details on the images included in this release. OpenShift Container Platform release 3.4.1.44.17 is now available. The packages and bug fixes included in the update are documented in the RHBA-2017:2670 advisory. The container images included in the update are provided by the RHBA-2017:2643 advisory. OpenShift Container Platform release 3.4.1.44.26 is now available. The list of packages included in the update are documented in the RHBA-2017:3049 advisory. The container images included in the update are provided by the RHBA-2017:3050 advisory. Space precluded documenting all of the bug fixes, enhancements, and images for this release in the advisories. See the following sections for notes on upgrading and details on the bug fixes, enhancements, and images included in this release. OpenShift Container Platform release 3.4.1.44.38 is now available. The list of packages included in the update are documented in the RHSA-2017:3389 advisory. The container images included in the update are provided by the RHBA-2017:3390 advisory. Space precluded documenting all of the bug fixes, enhancements, and images for this release in the advisories. See the following sections for notes on upgrading and details on the bug fixes and images included in this release. OpenShift Container Platform release 3.4.1.44.57 is now available. The list of packages included in the update are documented in the RHSA-2018:3752 advisory. The container images included in the update are provided by the RHBA-2018:3751 advisory. The release notes for xPaaS docs have migrated to their own book on the Red Hat customer portal. Added release notes for RHSA-2017:3389 - Moderate: OpenShift Container Platform 3.4.1.44.38 Security, Bug Fix, and Enhancement Update. Added release notes for RHBA-2017:3049 - OpenShift Container Platform 3.4.1.44.26 Bug Fix and Enhancement Update. Added release notes for RHBA-2017:2670 - OpenShift Container Platform 3.4.1.44.17 Bug Fix Update. Added release notes for RHBA-2017:1828 - OpenShift Container Platform 3.4.1.44 Bug Fix Update. Added release notes for RHBA-2017:1640 - OpenShift Container Platform 3.4.1.44 Bug Fix Update. Added release notes for RHBA-2017:1492 - OpenShift Container Platform 3.4.1.37 Bug Fix Update. Added release notes for RHBA-2017:1425 - OpenShift Container Platform 3.4.1.33 Bug Fix Update. Added release notes for RHBA-2017:1235 - OpenShift Container Platform 3.4.1.24 Bug Fix Update. Added release notes for RHBA-2017:0989 - OpenShift Container Platform 3.4.1.16 Bug Fix Update and RHBA-2017:1129 - OpenShift Container Platform 3.4.1.18 Bug Fix Update. Added release notes for RHBA-2017:0512 - OpenShift Container Platform 3.4.1.10 Bug Fix Update. Added release notes for RHBA-2017:0289 - OpenShift Container Platform 3.4.1.7 Bug Fix Update. Added release notes for RHBA-2017:0268 - OpenShift Container Platform 3.4.1.5 Bug Fix Update. Added an etcd performance issue to Known Issues. Added release notes for RHBA-2017:0218 - OpenShift Container Platform 3.4.1.2 Bug Fix Update. Added release notes for RHBA-2017:0186 - OpenShift Container Platform 3.4.0.40 Bug Fix Update. Added BZ#1415570 to Known Issues.